The MCE OptiBay for MacBook 13-inch (white/black) and MacBook 15-inch (non-unibody), replaces your internal SuperDrive (DVD drive) with a high performance SATA hard drive or SSD providing up to 2TB (2000GB) of additional internal storage space! The internal SuperDrive (DVD drive) of the non-unibody MacBook 13" and non-unibody MacBook Pro 15" is an IDE/PATA device. The MCE OptiBay converts, through hardware, between IDE/PATA and SATA so that you can use high performance, readily available 2.5" SATA hard drives and Solid State Drives (SSDs) in the optical bay of your system. Our new USB 2.0 Enclosure for your MacBook or MacBook Pro's SuperDrive is now only $29.99 when purchased along with the OptiBay! Easily install your internal SuperDrive into our ultra-slim, ultra-portable, specially designed USB 2.0 Enclosure and use with iTunes, iDVD, Finder Burning, etc. just as you did before! The enclosure is completely portable and powers from your USB ports and installing your internal SuperDrive into it is a breeze! 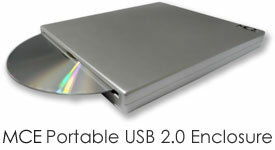 You can also choose to include our ready-made Portable 8x USB 2.0 Double-Layer SuperDrive with your OptiBay Hard Drive. This slim external SuperDrive provides you with a bootable, portable, bus-powered drive that is just as compatible with iTunes, iDVD and Finder Burning as before.1 You can use it to load system software, install applications, as well as play and burn DVD's and CD's. Use the drive only when YOU need it... and put it away when you don't! You can also choose the MCE External 20x DVD-/+R/RW FireWire/USB 2.0 "SuperDrive" to instead have the functionality of a higher-speed double-layer CD/DVD reader/writer at your disposal in a more stationary desktop form factor. 2LIFETIME WARRANTY on OptiBay Enclosure. Three-year warranty on hard drive or SSD. OptiBay Enclosure with SATA Interface requires a 2.5" SATA hard drive or SSD 9.5mm or less in height. With the Supreme OptiBay Installation Service ($99), MCE will overnight you a shipping package and overnight return shipping label that you may use to send your computer to the MCE Service Center for upgrade. Once MCE has performed the upgrade(s), usually within 1-3 business days, MCE will ship the computer back to you according to the shipping option selected at the time the order was placed. 1Apple's DVD Player application will not launch when there is no internal SuperDrive present in the system. In order to playback DVD movies from an external SuperDrive we have developed our own DVD Player Activator software, included with your OptiBay. This software, run one time only, allows Apple's DVD Player application to launch and play your DVD movies directly from your external SuperDrive just as though it were still internal.